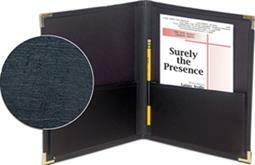 The 9"x12" Choral Rehearsal Folder is designed with durability in mind. Great for schools, churches, professional groups and individuals. These folders incorporate water resistant cover material, reinforced deep gusset pockets and spine, stitched edging, brass corners, and an internal pencil loop.